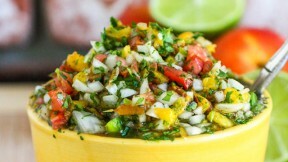 This grilled peach salsa recipe will top any mango salsa. Food blogger Jenna Weber suggests letting the recipe sit in the fridge overnight to meld the flavors. She shares her ideas in a full post on the Fresh Tastes blog.